German physician and prison-reformer; born at Altona, Germany, Oct. 3, 1783; died at Hamburg Aug. 20, 1862. He received his early education at Hamburg and at the Graue Kloster at Berlin. He studied medicine at Heidelberg and Würzburg (M.D. 1809), and, after conversion to Christianity, settled in Hamburg as a physician. During the wars of 1813 and 1815 against France he served as surgeon to the Hanseatic Legion. In 1825 Julius traveled through England; in 1834 and the two following years, through the United States; and in 1836, through France and Belgium. His writings upon the necessity of improvement in the conditions of prisoners attracted the attention of the Crown Prince of Prussia (later Frederick William IV.) to the author, who was invited to Berlin in 1840. He was attached to the Department of the Interior and retained his position till 1849, when, under the parsimonious régime which curtailed the force employed in all offices, he was dismissed. He then returned to Hamburg, where he continued to reside until his death. Julius took great interest in the condition of prisoners, and spent much time and money in his propaganda for bettering their lot. He was assisted in this work by his sister Henriette, an authoress. Julius was the author of: "Bibliotheca Germano-Glottica," Hamburg, 1814; "Mitteilungen über die Morgenländische Brechruhr," ib. 1822-31; "An Essay on the Public Care for the Sick as Produced by Christianity," ib. 1825; "Die Weibliche Fürsorge für Gefangene und Kranke Ihres Geschlechts aus den Schriften der Elizabeth Frey und Anderer," Berlin, 1827; "Vorlesungen über die Gefängnisskunde," ib. 1828 (French transl. by Lagarmitte, Paris, 1831); "Amerika's Besserungs System und Dessen An wendung auf Europa," Berlin, 1836; "Nordamerika's Sittliche Zustände," Leipsic, 1839; "Beiträge zur Britischen Irrenheilkunde," ib. 1844, etc. He translated belletristic literature, as Ticknor's "Geschichte der Schönen Litteratur in Spanien," Leipsic, 1852, etc. From 1821 to 1835 he published, with Gerson, in Hamburg, the "Magazin der Ausländischen Literatur der Gesammten Heilkunde." 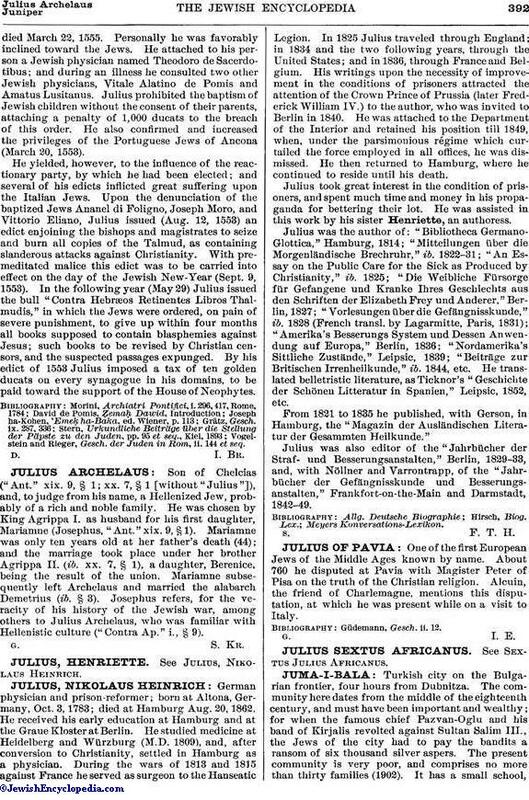 Julius was also editor of the "Jahrbücher der Straf- und Besserungsanstalten," Berlin, 1829-33, and, with Nöllner and Varrontrapp, of the "Jahrbücher der Gefängnisskunde und Besserungsanstalten," Frankfort-on-the-Main and Darmstadt, 1842-49.